Ashton's watercolour was painted when he was a staff artist for 'The picturesque atlas of Australasia'; a position which allowed him to travel widely. The Hawkesbury soon became a favourite haunt for painting. He returned to it frequently with artist friends. This view of Sentry Box Reach is a classic example of nineteenth-century British watercolour technique – transparent washes of watercolour over barely perceptible pencil outlines, occasionally with some minor scraping out for highlights. It is a particularly convincing study of the expanse and conditions of the Hawkesbury landscape. The work was exhibited in the Art Society of New South Wales annual exhibition, held at Sydney Town Hall, and which was open 19 April to 1 May 1888. Signed l.l., brown watercolour "J.R. ASHTON". Dated l.r., "1884". 'Baarmutha', Windsor and Richmond Gazette , 'Sentry Box Reach', pg. 5, Windsor, 09 Jan 1925, 5. Hendrik Kolenberg, Australian watercolours 1880s to 1990s , 'Introduction: Painting in watercolour', pg. 8-16, Sydney, 1995, 2-3 (colour illus. ), 8-9, 17 (colour illus. ), 113. cat.no. 1. The colour illustration on pages 2-3 is a detail of the image. Now came still evening on , Sydney, 1941, 51. Illustrated Sydney news , 'The Art Society's exhibition', pg. 11, 16, Sydney, 15 May 1888, 16 (illus.). 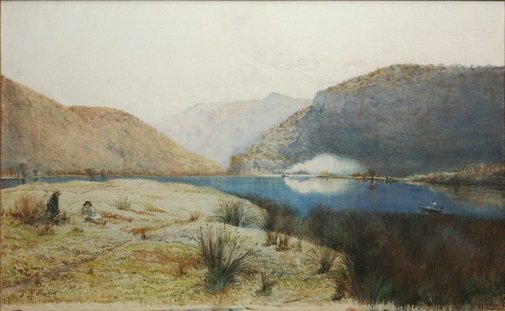 Line drawing by Arthur Collingridge of works in the Art Society of NSW exhibition, including Ashton's watercolour 'Scene on the Hawkesbury', illus.no. 5. The Sydney Morning Herald , 'The Art Society's exhibition', pg. 4, Sydney, 20 Apr 1886, 4. "Mr Julian R Ashton has a number of charming views taken on the Hawkesbury River, amongst the best being 'Webb's Creek' (227) and 'Sentrybox Mountain' (192)'. Australian watercolours 1802-1926: in the collection of the National Gallery of Victoria , Melbourne, 1991, 71 (illus. ).